Ganga, Krishna, Kaveri, Narmada – many of our great rivers are depleting fast. If we don't act now, the legacy we hand over to the next generation will be one of conflict and deprivation. These rivers nurtured & nourished us for thousands of years. It is the time we nurture and nourish them back to health. The rivers of our country, Are quite polluted, as you know. So, keeping them clean and pollution free, Is a gratitude to them, we must show ! Our very own rivers, Are quite unique than the others, For unlike them all, Our rivers have many more sisters and brothers. The rivers of India, Give life to this country, So isn’t keeping them clean and tidy, Each and every citizen’s duty ??? 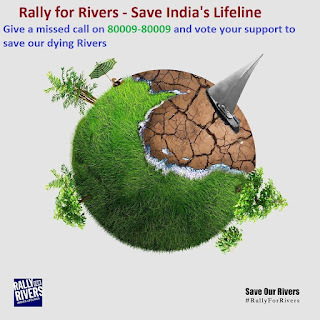 “Rally for rivers” is a program, Which aims to save these wonderful rivers. From the debris and garbage ,which pollute them, Each and everyday , month and year. So , what can we do to help these rivers? Which help us everyday without fail, Let us also take a step forward, And help our rivers, flowing with a long trail.!! !